Theri There from 2006-01-02: How do you draw what can’t be seen? Notes: A behind-the-scenes look at how I first started planning Theri There. 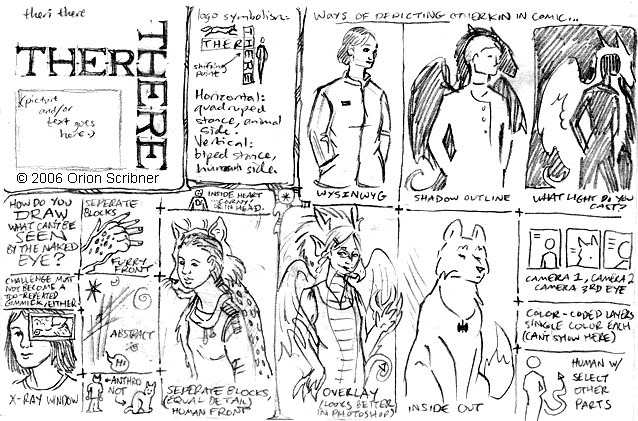 This sketch deals with the key challenge of how to show that someone is an otherkin. After all, their physical appearance can look entirely unlike how they describe their otherkin self. At the time, I'd seen very few attempts at conveying this dichotomy in art. In this sketch, I came up with as many ideas for it as I possibly could. I ended up using some of those ideas in Theri There. If some of these ideas might suit your own otherkin portraiture, please feel free to try them out, too! Transcript: Inside the logo, a note that says "Picture and/or text goes here." "Logo symbolism. Horizontal: quadruped stance, animal side. Vertical: biped stance, human side." An arrow points at the ambiguous letter where the words overlap one another, saying, "shifting point." "Ways of depicting otherkin in comic..."
A picture of a person. "WYSINWYG" (what you see is not what you get). A person with a dragon silhouette around them. "Shadow outline." A silhouetted person with a luminous dragon outline around them. "What light do you cast?" "How do you draw what can't be seen by the naked eye?" A picture of an animal paw juxtaposed on a human hand, equally detailed. "Separate blocks. Furry front." "Challenge must not become a too-repeated gimmick, either." A person's face with a comic panel superimposed over part of their head, showing a feline face inside. "X-ray window." "Abstract:" A not-too-serious doodle of crisscrossed rays, stars, and symbols, which is uttering a speech balloon that says "Hi." A person with lynx ears, labeled "anthro," followed by an ordinary lynx, labeled "not." A person with an animal drawn on their chest. "Inside heart (...corny!) or in head." A person juxtaposed on an animal. "Separate blocks. (Equal detail.) Human front." A person with a transparent dragon figure superimposed over them. "Overlay. (Looks better in Photoshop.)" A picture of a thoughtful wolf wearing a labrys pendant. "Inside out." A thumbnail sketch of a three-panel comic, with a human replaced with a canine in the middle panel only. "Camera 1, camera 2, camera 3rd eye." A human with a dragon tail. "Human with select other parts."